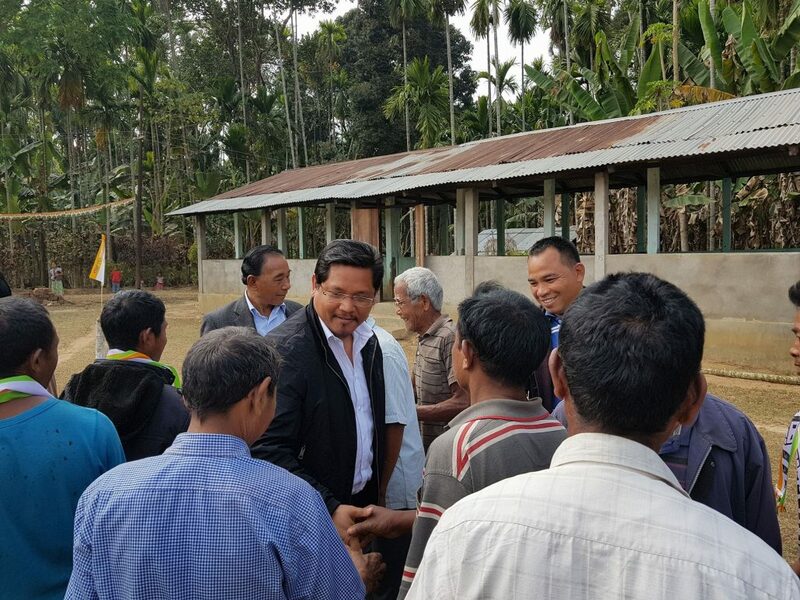 NPP chief Conrad Sangma interacting with voters on Saturday. National People’s Party(NPP) chief Conrad K Sangma on Saturday branded Meghalaya chief minister Mukul Sangma as a “Congress CM”. “He (Mukul Sangma) has not worked at the interest of the state but has furthered the interest of his close aide and only the Congress workers and supporters,” Conrad said at an election rally at Dopa Apal under Resubelpara constituency, where he was campaigning for NPP candidate Timothy D Shira. Citing that under Mukul regime the distribution of MLA scheme was “party people centric”, he reminded the role of a legislator was to work for the interest of entire people of the constituency once elected. “It is the responsibility of an elected leader to work equally for all but it is shameful that most Congress leaders have only worked in close tandem with some leaders of the party, who has vested interest depriving the people of the constituency they represent at large”, he said. Explaining to the people that “irresponsible leaders” of the society should be taught a lesson, he requested the public to vote for a party and its leaders, who once elected work for the interest of the entire constituency. “As leaders, we should not be selective. We have to become their voice and their true representative while initiating welfare and development,” he added. Hitting out at Mukul and other Congress leaders for the distribution of blankets ahead of election, he said, “In eight years, Mukul and his comrades realised that winter comes only during election and decided to distribute blanket. If the blankets were good, I could have acknowledged them for their effort but surprisingly the blankets which were distributed were of poor and cheap quality”. Talking pot shots on the chief minister, Conrad said, “He (Mukul) thinks he is a great strategist and he knows the magic to win elections but enough is enough, people have realised his misdeeds. Those selected people who were given blankets have come out to express their dissatisfaction and have vowed that this time Congress will be taught a lesson”. Giving example of Songsak constituency, where Mukul is contesting apart from Ampati, his home turf, Conrad said, “People in Songsak were very happy with the blankets distributed by Mukul but soon they realized that it was of poor quality. However, they are still happy because they got a rope to tie pigs and cattle. They tell me that the blanket after washing has become a good rope”. Terming that Congress party and their leaders made effort to be selective in distributing the blankets but they failed to realise that freebies which they provided with the intention to garner votes have fall back on them as they compromised on the quality. “Misdeeds and wrong intention cannot be hidden for too long,” he added.